That’s right, regular season baseball is back baby! Yes, we had the random two-game Japan series where Ichiro played his final games (Gonna miss ya Ichiro! ), but yesterday was the true opening day and it’s time to get rolling. A successful fantasy owner is always looking to improve their roster, even on the second day of the regular season. It’s never too early to hit the fantasy baseball waiver wire to grab guys that have come into regular playing time or had a hot spring training. If guys like Fernando Tatis Jr and/or Chris Paddack are still sitting on your waiver wire, you’re better off finding a more competitive league next season. I’ll be quick here. Why is Pete Alonso not nearly universally owned yet? WAKE UP PEOPLE! The 95% Fantrax ownership rate is due to the high number of dynasty leagues on the site, but those Yahoo/ESPN rates need to be double that. Yes, Alonso needs to be owned in 112% of Yahoo leagues. By this point, you’ve read me ramble about Alonso ad nauseum, so I’ll just leave you with one more sentence. Alonso is one of the top prospect power bats and has a real chance at 30-plus homers this season. Now, please do me a favor and check your league’s waiver wire if you’re in a re-draft league. "Pete" Alonso LAUNCHED the very first pitch he saw for a HR to center. The long-awaited decision of whether Ryan McMahon or Garrett Hampson would be the opening day starter for the Rockies was answered when McMahon was listed as the starter and hitting 7th on the lineup card yesterday. Yes, a piece of me died inside with how much I had been pumping Hampson this offseason, but McMahon definitely earned this. I mean, all the man did was finish second in batting average during spring training (.424) while adding three homers and 14 RBI in 24 games. There’s not much, if any, speed upside here, but McMahon was one of the best pure hitters during his minor league career and has .280/20 upside this season if he can get 500 AB. Make sure he’s still not sitting on your leagues waiver wire. 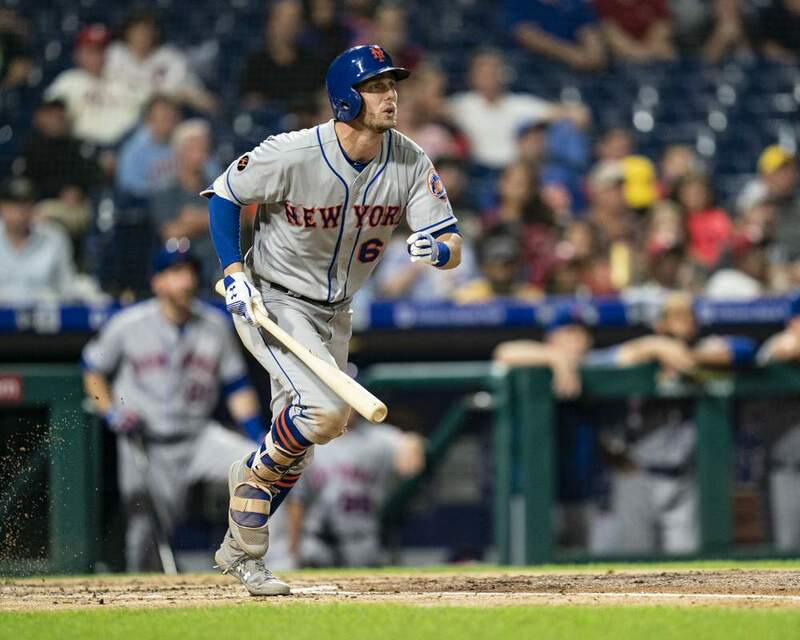 With Todd Frazier on the IL, Jeff McNeil will be getting the bulk of playing time at the hot corner to start the season. Fantasy owners rejoice! McNeil was a waiver wire darling in 2018, hitting .329 with three homers and seven steals in 225 at-bats. The strong performance carried over into spring training where McNeil hit .352 with four dingers in 54 at-bats. Obviously, the high batting average was McNeil’s biggest asset last season, but how much of that was fueled by a higher .359 BABIP? Maybe not as much as you might think. Out of the 355 players with 200-plus plate appearances last season, McNeil ranked 39th in contact rate, 58th in Z-Contact, 36th in O-Contact, 2nd in Z-Swing%, and had the 5th lowest strikeout at 9.7%. So, sure, that BABIP inflated his batting average a tad, but with McNeil’s contact skills, a strong batting average near or above .300 should be expected. Add in his 15/15 full-season potential and multi-positional eligibility and you have a strong waiver wire addition for your fantasy squad. Even when Frazier returns, McNeil is still likely to get regular at-bats split between multiple positions. Speaking of multi-positional eligibility. With Hernandez being named the starter at 2nd base, his stock went from deep league target to mixed league sleeper due to the power upside he brings to the position. Hernandez was on a 30-homer pace last season, slugging 21 home runs in just 402 at-bats. And what do you know, it didn’t come with a puke-worthy batting average like we were accustomed to seeing from him in 2016-2017. Hernandez cut his strikeout rate from 23.4% in 2016 to 16.9% last year while also improving in many contact/swing facets. If those improvements carry over into 2019, Hernandez should hit enough to keep the 2B job this season and be one of the top power bats at the position. The SS and OF eligibility he’ll have in most leagues is just gravy. And who doesn’t like gravy? The lack of love for Brett Gardner is astonishing. The man scored 95 runs last season and is going to be playing every day, sometimes leading off, in a potent New York Yankees lineup at least to start the season. Sure, the .236 average last season wasn’t anything to right home about, but Gardner has been one of the most consistent fantasy outfielders around over the last several seasons. He’s recorded 15+ steals in six straight seasons (would be 10 straight if not for his injury-shortened 2012 season) and double-digit homers in four of the last five seasons. If given 500+ AB, you can pencil him in for at least a 10/10 season with 80+ runs to go along with it. And before last season’s .236 mark, Gardner was annually in the .255-.275 range, so I’m not overly worried about the batting average dip, especially since his 87.6% contact rate last season was his highest mark since 2011. When Aaron Hicks comes back, we’ll have to reassess the situation, but it’s more likely that Greg Bird loses playing time so the Yankees can get Giancarlo Stanton back to DH. For now, Gardner should be owned in more leagues. With all the prospect power in the Tampa Bay system, a solid, yet un-flashy guy like Lowe tends to fly a little under the radar. While he doesn’t have huge power or speed upside, Lowe has the potential to help fantasy owners out across the board this season while providing multi-positional eligibility as well. In 100 games last season split between Double-A and Triple-A, Lowe hit .297 with 22 homers and eight stolen bases, and was a .281 career hitter in the minors with a 19.8% strikeout rate. With his above-average contact skills and modest power, Lowe could very easily finish 2019 with a .275/15-20 type line with a hint of speed mixed in. The former #1 overall pick is back! At least for now he is. After opening day and the Japan series, Tim Beckham is your current Major League home run leader. That’s probably going to be the first and last time I can say that sentence. In his three games thus far, Beckham is 7/12 with three homers, five RBI, six runs scored, and two walks. Now, we’ve seen this in the past and have witnessed the up and down nature of Mr. Beckham. After a mid-season trade to Baltimore in 2017, Beckham finished the season on a tear, hitting .306 with 10 homers in 216 AB. He then proceeded to hit just .230 with 12 homers last season, dropping him off the mixed league radar. Is he back on the radar? For now. How long he’s back on remains to be seen, but we’ve seen some solid hot stretches from Beckham in the past so it’s worth an add to see if this is the start of another. Taking Chris Sale deep twice in three innings is damn impressive. Those that added Eric Lauer last season for the stretch run or fantasy playoffs were rewarded with a 1.07 ERA, 0.99 WHIP, and 8.9 K/9 over Lauer’s last five starts. He was also one of the Padres best pitchers this spring, tossing 10 shutout innings, allowing only three hits and two walks while striking out 12, and started the season with six shutout innings yesterday. This San Diego rotation has some sneaky-good upside this season and Eric Lauer is part of the reason for that. Don’t go hog wild for him, but he’s worth an add in mixed leagues to see if his late-season success was the start of something more. Yes, a Miami Marlin has fantasy value this season. Shocking, I know. Smith was cruising from April 22nd through the end of May before faltering in June and undergoing surgery on hit lat, ending his season. And when I say he was cruising, I mean it. In seven starts (40.2 IP) from 4/22 to 5/28, Smith posted a 2.21 ERA, 0.85 WHIP, 2.4 BB/9, and 10.6 K/9. With Dan Straily being DFA’d, Smith will open the season in the rotation and carries solid strikeout upside at the very least. The wins likely would be bountiful, but one can do worse than a potential 3.75 ERA and 10 K/9 off the waiver wire. While you’re at it, check to see if Pablo Lopez is available too. Lopez was a force to be reckoned with in spring training, recording a 0.90 ERA, 0.55 WHIP and a 16/1 K/BB ratio in a team-leading 20 innings of work. He’ll open the season in the Marlins rotation and is turning into a popular breakout candidate for 2019. Those numbers are impressive at first glance and even more impressive when you consider that Wilson (20) and Wright (22) were both young for the levels. Both have dynamic arsenals with the upside to post solid ratios and around a strikeout per inning, so grabbing them now could turn into a good season-long investment if either one can remain in the rotation. The potential reward outweighs the risk here. The Twins bullpen situation is anything but fluid right now. But if opening day is any indication, Rogers appears to be firmly in the saves mix to start the season. It makes sense, too. Rogers has improved in each of his three Major League seasons, posting a career-best 2.63 ERA, 0.95 WHIP, and 9.9 K/9 last season. He has the arsenal to succeed in the role, though I still expect Trevor May to get chances as well. If you missed out on those infamous closer runs in your draft and need a boost in your bullpen, Rogers is a great target.